Rain gardens are growing popularity and are beginning to appear in Massachusetts. A rain garden is simply a depression in the landscape that collects stormwater runoff. Roof, sidewalk or driveway runoff is directed towards the landscaped area rather than to the storm drain. By directing the runoff to landscaped areas, the rain water infiltrates through the soil. This allow basic treatment of runoff; the removal of sediment and bacteria, and nutrient, reduction, particularly nitrogen and phosphorus through plant up-take. Rain gardens help reduce erosion, improve water quality of lakes and rivers, and increases groundwater recharge. Using stormwater reduces dependency on potable water sources for irrigation, saving homeowner time and money. Once established rain gardens require little maintenance; consisting only of regular weeding and annual mulching and pruning. Fertilizing is not part of the care of your rain garden. Rain gardens are beautiful additions to your yard and create native habitat for birds and butterflies. For your rain garden, select native plants that are tolerant of wet and dry conditions and consider the exposure of the area to sun and wind. Your rain garden should be designed to hold up to 6 inches of rain fall, but should not hold standing water for more than 24 hours. The soils should be well draining; a good soil mix is 50-60% sand, 20-30% top soil, and 20-30% compost. You don’t need a professional landscaper or engineer to design your rain garden. Any effort to reduce stormwater runoff is a benefit to the environment. 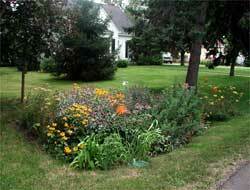 There are many resources available on-line to help you create your rain garden. In Massachusetts, with an annual rainfall of roughly 45 inches, one rain garden from a 1000 square feet area, can treat and recharge 25,000 gallons of water each year. If 40 rain gardens are installed in your neighborhood, that’s 1 million gallons saved each year. 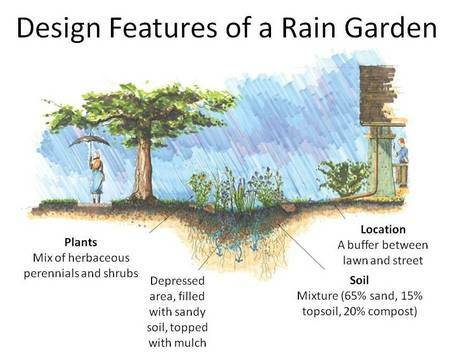 For more information on how to create a rain garden, a publication found on the EPA website Rain Gardens for Home Landscapes.